There is a small pocket encircling each tooth between the tooth and the gums. Unfortunately, no matter how well a patient performs their at home hygiene, the toothbrush and floss can only reach about 3mm into that pocket. 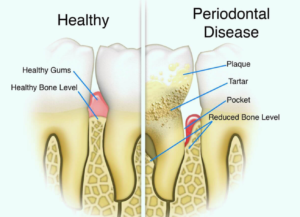 If the pocket is deeper than 3mm and/or there is hard tartar or “calculus” build-up on the tooth surfaces then it may be necessary to have a scaling and root planing or “deep cleaning”.